You could say that the Grand River Dam Authority is dedicated to the MidAmerica Industrial Park. Industrial power … The GRDA Distribution Crew works to make repairs to a power line in the MidAmerica Industrial Park. The crew is stationed at the GRDA Transmission Headquarters, adjacent to MidAmerica, and is dedicated to maintaining the electric system that powers resident-industries in the Park (photo courtesy of Gerald Lacy). After all, GRDA’s Transmission Headquarters, which houses the personnel and equipment that maintains the Authority’s power lines, is located adjacent to the industrial park, along Highway 69A. Meanwhile, on the other end of MidAmerica (MAIP), the GRDA Coal Fired Complex has been providing abundant, reliable electricity to park residents for over 30 years. GRDA is proud to supply the power for most of MAIP’s 80 resident-industries that collectively employ about 3,400 people. Still, there is one other key fact that illustrates GRDA’s commitment to MidAmerica residents: the GRDA Distribution Crew. This crew, comprised of GRDA power line maintenance personnel, spends much of its time in MAIP’s boundaries, maintaining the critical lines and other components that distribute GRDA electricity to the plants, warehouses and offices used to produce Oklahoma-made products. It is a 24/7/365 process and one that helps support Oklahoma’s economy with jobs, goods and services. It is also a process that has not changed much over the years. While manufacturing methods and materials have advanced, the need for abundant, reliable electricity has remained the same. As the New Year begins, GRDA looks forward to continuing to provide the “power for progress” that helps support Oklahoma industry. 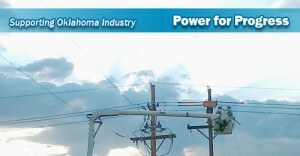 Headquartered in Vinita, GRDA is Oklahoma’s state-owned electric utility; fully funded by revenues from electric and water sales instead of taxes. Directly or indirectly, GRDA’s low-cost, reliable; electricity serves nearly 500,000 homes in Oklahoma and stretches into 75 of 77 counties in the state. At no cost to Oklahoma taxpayers, GRDA also manages 70,000 surface acres of lakes in the state, including Grand Lake, Lake Hudson and the W.R. Holway Reservoir. Today, GRDA’s 500 employees continue to produce the same “power for progress” that has benefited the state for 75-plus years.